In yet another high publicity incident as young woman in Saudi Arabia is arrested for refusing to wear hijab. 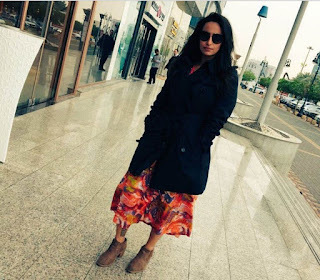 The daring woman, who has been named as Malak Al Shehri, shared a picture of herself while standing on a street in Riyadh. That was more than enough to have her picked up by the authorities. In case you didn't know, It is illegal in Saudi Arabia to not wear an abaya – a traditional full-body covering – and Muslim women must also wear a hijab, although foreigners don’t need to. The country is also the only one in the world to ban women from driving and prohibits mixing of the sexes in certain situations—watched closely by the ever vigilant religious police. Echoes of the west and the power of social networks. Malak Al Shehr, who was pictured on social media wearing a black jacket over an ankle length dress, was arrested after a complaint was filed by religious police, al-Sharq reported. She won the challenge and lost her freedom. But some other commenters were more supportive, Farah Aqqad wrote: ‘Its about time to protest against this discriminative abaya prison against women #shout_for_freedom’. The Kingdom is known for not being easily swayed by public opinion or public pressure when carrying out sentences for crimes like this. So it is more likely than not that Malak Al Shehri will pay dearly for her social media stunt.